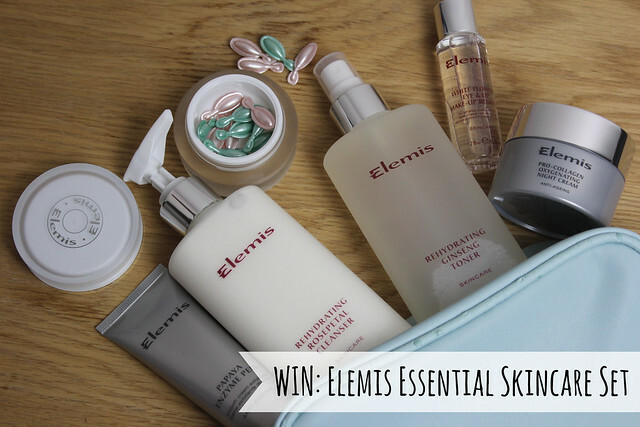 To celebrate the fact that this rather fabulous Elemis Essentials Skincare set is going to be the QVC TSV on Sunday 8th September, I have been given one to give away to you guys! The kit really is fab – it contains the Rehydrating Rosepetal Cleanser, Rehydrating Ginseng Toner, a 28ml White Flowers Eye and Lip Make-Up remover, the fab Papaya Enzyme Peel plus the Pro-Collagen Oxygenating Night Cream and the Cellular Recovery Skin Bliss Capsules – all housed in the perfect for travel sized zip up pouch. The whole kit is worth £147 but will be on sale on QVC on Sunday for the bargain price of £47! My personal favourite item from the kit is definitely the Cellular Recovery Skin Bliss Capsules – I think these are fab and make skin feel amazing. I’ve been using as an overnight treatment and my skin absolutely loves them. Plus they’re ideal to pop in a travel bag if you want a little pampering boost without needing to carry a full set of face masks and the like. To enter to win one of these kits, just use the rafflecopter widget thingy below! Good luck! Prize and PR sample provided by Elemis. Amazing prize, would LOVE to win! Removing all makeup before bed makes a real difference to my skin. I use jojoba oil to rehydrate my dry skin. It also works great as a cleanser and an eye makeup remover, 3 in 1! My number one skin care tip is to always wash your face in the morning & before bed even if you’ve not worn makeup – keeps my skin so much clearer and can really tell the difference when I skip that step! I have never used Elemis before, my friend raves about it! My number one (and quite cheesy) beauty tip is to smile. Nothing makes you look more beautiful than a happy, natural smile. Looking for the joy in everyday life will make you far more beautiful than any gadget (and that’s coming from a girl who’s in love with her Clarisonic – which would be my second tip!!). Wow, that’s a great deal on that gift set – thanks for letting us know. Avocado oil is my tip! Always remove make-up before bed, messy pillows and messy skin. My number one skincare tip is to let your skin breathe once a week by having a no make-up day! I’ve only ever tried one Elemis product at a beauty counter before so it’d be great to try more than just one product. Thanks for the giveaway! My skincare tip would be to cleanse twice and use moisturizer in the morning and night. I am OBSESSED with Elemis! have been trying out new products lately and my skin is not thanking me for it so this set would be a godsend! My number one tip is to massage a face oil into skin before you put on a mask. Pop on your mask, go to sleep and wake up with dewy, glowy radiant skin! My no.1 beauty tip would be to use non-physical exfoliators. They have made the most difference to my spot prone skin and would LOVE a chance to try the ELEMIS papaya enzyme peel! I love Elemis so much, had to give this a try! My skincare tip is freeze fresh pinapple juice in ice cube tray and then rub a frozen block over your skin for a simple Fruit Enzyme boost ! My biggest skincare tip is to wear sunblock every day! coconut oil for cleansing and moisturizing. My skincare tip is – always take your makeup off before bed!! I always take off my make up before bedtime and drink lots of water too. Brilliant prize. I think that good skin cleansing morning and evening is very important. Number one skin care tip: Remove face mask with a flannel of some sort. As simple as that sounds, that has been revolutionary for me. I’ve spent more days than I wish to remember scrubbing at stubborn mud masks with water dripping down my elbows to the floor, my nails clawing at face – I did more damage than good. Total game changer for me and another awakening to the fact that I’m so slow and hopeless! Always wash your face at night, and keep hydrated! My skin are tip is to keep eye make up remover in the fridge and then use it on cotton wool pads , as an eye mask, to refresh the eyes. Cleanse and tone morning and night even on no makeup days your skin will still look good. My number 1 tip is to keep hydrated so drink water, water and then more water!! Drink lots and lots of water. Simple but very effective. Water is great – when ever I feel tired I always try to drink water to give me a little pick me up….. Always remove make up before going to bed – wipes are great for this as they cleanse, tone and moisturise all in one go and get rid of all traces of eye make up. Drink plenty of water to keep skin hydrated! I have never tried Elemis but my daughter-in-law loves it and guards it from all of us! remover every scrap of makeup at night no matter how tired you are! moisturize, moisturize and then moisturize again! Get enough sleep, easier said than done, but your skin won’t look so tired if you’re fully refreshed. I always use a face scrub twice a week to get any embeddied dirt off. Double cleanse at night if you have been wearing makeup or sunscreen! Splash your face with cold water after washing to reduce pores! What a great giveaway! My skincare tip is to use an exfoliating toner twice a day — it makes such a difference! Drink lots of water and always take your makeup off at night. Take off your make up before bed! Drink lots of water and don’t have too much sugar. eats lots of good fats and essential oils found in food lie avocado, olive oil, nuts, seeds, oily fish etc. Nourishing your skin from the inside is the best way to achieve a healthy, glowing complexion. Use the right type of product for your skin type. Sounds obvious but such and easy mistake to make and can really make a difference. My best tip is to treat yourself to a purifying face mask once a week. I know it’s what every one says but it’s true. The different in your skin after a few days is insane! My number one skincare tip is to massage in your cleanser for a good minute or two. I find it gives me a real glow afterwards! Once you’ve found a product that works, don’t switch from it. 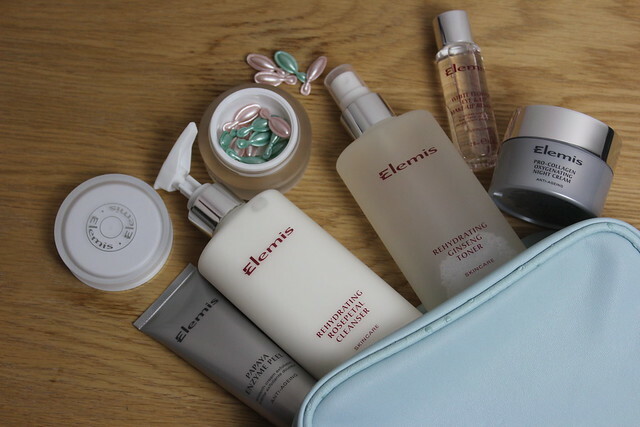 My tip is to use Elemis…..fantastic products that make your skin look fab! Also, drink plenty of water! Don’t forget to moisturise your neck, so many forget but it needs as much TLC as your face. use Cymex nightly, it prevents ALL dryness problems, its brill! Massage castor oil on face once or twice a week for super soft skin. Great prize! Always use a good moisturiser. My number one tip is to always cleanse before bed! Exfoliate often and invest in a good quality mosturiser!! USE TOOTHPASTE ON SPOTS TO DRY THEM OUT! just cleanse tone and moisturise twice a day is the best tip a girl can have! Putting rose hip oil, as a night treatment before you go to bed. It smoothes out your skin, reduces scarring and wrinkles, and you wake up with a glowing complexion in the morning. always moisturise the back of the hands with your face cream. Cleanse, tone and moisturize daily.